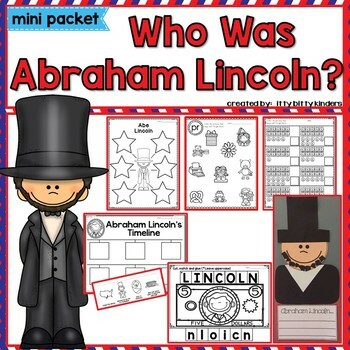 This mini-packet will help you introduce Abraham Lincoln in an EASY, FUN, and FAST way. 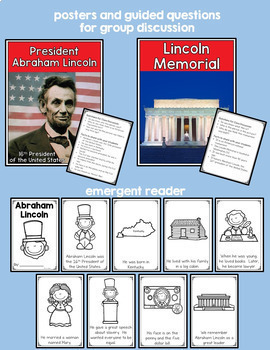 It includes activities to teach your students in a span of 2-3 days about the sixteenth President of the United States. • a variety of printables including: word search, uppercase/lowercase letter matching, recording sheet for facts, cut and paste, writing (2 options), teen numbers. Please open the preview to see more of what’s included. Also includes: Venn diagram and cut and paste T-chart activity comparing Washington and Lincoln and Lincoln and Trump. 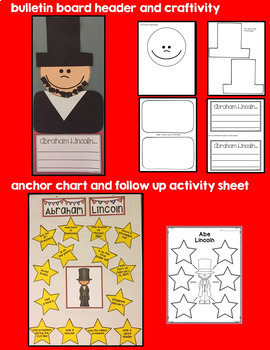 (these activities and bulletin board display can be used if you’re also teaching about George Washington and Donald Trump in your class). 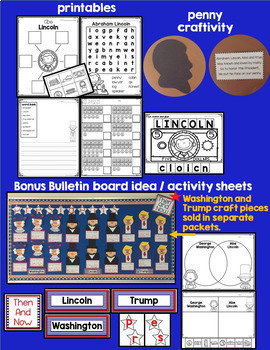 PLEASE NOTE: The craft pieces for the bulletin board display can be found in our George Washington and Donald Trump mini packets in our TPT store (They are NOT included in this packet). If you want all 3 President 'mini packets' you can save 20% with this bundle! This resource is part of our new upcoming series. These mini packets will include activities to teach special days/ holidays in a short amount of time. Note: All of them also available in Spanish. Don't forget that leaving feedback earns you points towards FREE TPT purchases. We love teacher's feedback! Follow us and be notified when new products are uploaded. New products will be offered at 20% off for the first 24 hours.